ENVIRONMENT MINISTER ALAN Kelly has today announced a grant will be introduced to help people replace pipes in their homes as figures from Irish Water suggest pipes in thousands of households contain lead. Through its metering programme, Irish Water identified approximately 26,000 homes that potentially have lead pipes. However it is estimated up to 200,000 homes in the country could be affected by this Jerry Grant, Head of Asset Management for Irish Water said today. Dublin plumber Paul Whelan told TheJournal.ie that replacing lead pipes in a home would cost, at a minimum, €1,500. “The lead pipe may only come in as far as the doorstep and after that it might be copper but I have seen it go all the way in as far as the kitchen sink,” he said. For a property like this, pipe replacement could cost up to €5,000, he told us. “Pipe work is supposed to be down 18 inches so you have to dig down into the garden and the first six inches is fine with a shovel but after that you need to get down deeper, it’s a bit more work,” he explained. The issue was discussed at Cabinet today and a national strategy to reduce exposure to lead in drinking water was approved. A grant scheme for ‘low-income households’ will now be introduced to help householders in affected properties to replace their pipes. The Department of Environment has not given any indication of what the income threshold for this grant might be. Minister Kelly said today he further details of the grant scheme will be announced at a later stage and he expects people will be able to avail of it later this year. 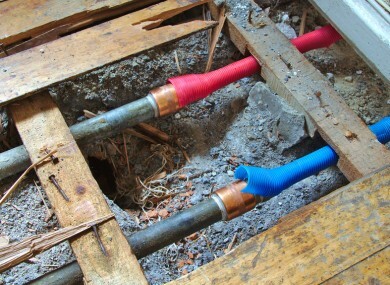 Where a homeowner opts to replace lead pipes, Irish Water will replace corresponding lead pipes on the public side. Pipes in all publicly owned buildings will now also have to be assessed as part of this strategy. Anyone in Ireland living in a house built up to and including the 1970s could have lead pipes. The company is now urging customers to check their pipes and take remedial action if required. Advice on how best to go about this will be issued as part of the strategy approved today. Email “Replacing lead pipes could cost affected homeowners up to €5,000 ”. Feedback on “Replacing lead pipes could cost affected homeowners up to €5,000 ”.